St. Paul is the evangelizer extraordinaire! Jesus began the proclamation of the Gospel, and Paul, the apostle to the Gentiles, took the Gospel worldwide. It all began on the road to Damascus. Jesus called him personally, “Saul, Saul” (Acts 9:4). Evangelization begins with a personal encounter with Jesus himself. It is impossible to proclaim Jesus with integrity and conviction without knowing him individually on a first name basis, a foundation that disciples of today build and maintain in prayer. Next, Jesus told Paul, “You will be told what you must do” (Acts 9:6). Evangelizers are both called by Jesus and receive their instructions from him. Evangelization is about promoting Jesus and his Gospel, not promoting one’s self. As John the Baptist correctly observed, and Paul put into practice, “He must increase; I must decrease” (John 3:30). Paul was energized by the Holy Spirit, a spiritual gift that he received when he was baptized (Acts 9:17,18). Evangelizers do not operate on their own power, but on divine power. When it comes to the desire and energy to proclaim Jesus and his Gospel, it is supplied by the Holy Spirit, grace given in baptism, reinforced in the sacrament of confirmation and renewed in prayer. After preaching in Damascus, Paul traveled to Jerusalem where he tried to join the disciples (Acts 9:26). He knew from the outset that it was essential to be connected to the Christian community. Evangelizers are not “lone rangers.” The Gospel does not belong to any individual person. 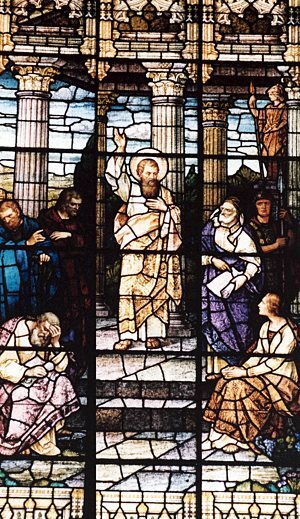 Proclamation must be done in union with the teaching authority of the apostles, subject to their guidance and approval, never reduced or embellished, and true to what Jesus said. Paul’s efforts at evangelization quickly met resistance. Some were afraid of him, others doubted him, and a few tried to kill him. It came as no surprise that he was opposed by outsiders. The shock was the bitter resistance from insiders. Paul did not fold under pressure. He did not allow himself to be silenced by his critics. Instead, he renewed his commitment and forged ahead. Evangelization is not for the faint of heart. It will test the strength of our resolve. When we share the story of Jesus, strangers may ignore, ridicule or reject us. What is most hurtful is when members of our family or church resist. Jesus met with resistance. So did Paul. So will we. Like them, we must never succumb to negative pressure. Paul made three missionary journeys to spread the Gospel. The first (c. A.D. 37-46) was to Cilicia, Syria, Cyprus, and Galatia; the second (46 to 51) to Asia Minor and Greece; and the third (52-56) to Ephesus, Corinth, Macedonia, Illyricum and back to Corinth. After these, he made a final trip to Rome. Paul’s strategy was to preach to Jews first, then to Gentiles. All staunchly clung to their own beliefs — the Jews to the Law, Gentiles to a pantheon of gods: Zeus and Apollo, Artemis and Athena, Aphrodite and Asclepius, to name a few. Paul went to synagogues and pagan temples alike, and he courageously told the story of Jesus to those who had never heard about him or did not believe in him. Paul traveled thousands of miles, some by boat, most by foot, and he braved storms, scorching heat, frigid cold and rugged terrain — all for the sake of the Gospel. If he could travel so far, maybe we can at least travel a short distance — to a next door neighbor’s home, school, work, store, theater or arena, and look for opportune moments to share our faith in Jesus with others. Finally, Paul endured many hardships for the sake of the Gospel. Five times he received 40 lashes minus one, he was beaten three times with rods, once he was stoned, and three times he was shipwrecked. He also suffered sleepless nights, hunger and thirst, cold and exposure, and terrible anxiety (2 Corinthians 11:24-28). Paul was incredibly resilient. The Gospel is such a treasure that Paul was irrepressible when it came to sharing it. We, too, will face obstacles, some which may seem insurmountable. Like Paul, we must not let anything keep us down, but carry on with the proclamation of Jesus, the Messiah and Lord, Savior and Redeemer, and the Son of God.